So, this is our first installment of Tip Thursday where we will spotlight a tip or factiod that will help you save energy, money, and the environment. Today's deals with your washer. You can save a lot of money by just cutting the hot water out of your clothing washes. 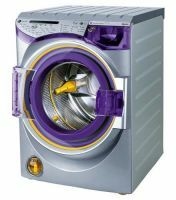 When using a washer, about 90% of the total energy used goes into heating the water. While about 10% goes into powering the actual washer. You should use cold water and cold water detergents whenever you can.